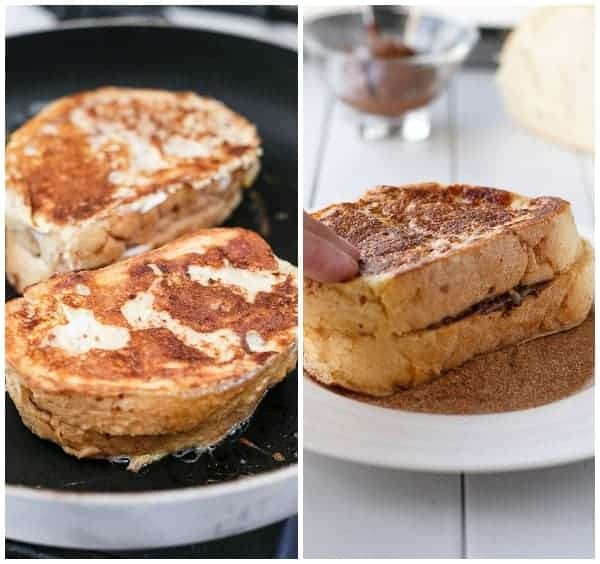 Also known as the best French Toasts you’ll ever try. Buttery, coated in Cinnamon Sugar and FULL of CHURRO flavour. I heart Churros. And Nutella. And this right here is the best of BOTH worlds. Hi. My name is Karina, and I’m a self-confessed, chocolate obsessed, Churro and Nutella addict. And being that you’re here, reading this, or just shooting down to get the recipe asap…I’m guessing you are too. It’s so nice to meet you. As usual, the story goes like this: Woke up. Craved Churros. Didn’t have any. Had a dilemma. How to fix it? Make some. But the shortcut version of it. How? French toasts. Welcome to the inner parts of my brain. That’s exactly how I have conversations — with myself. I kinda just agreed with…ummm…myself, and letting out an exasperated sigh, dragged myself into the kitchen and made these for breakfast. Ok, so maybe not so dragging my feet… More like jumped-outta-bed-and-skipped-while-running-at-the-same-time-stepping-on-some-leggos-but-doesn’t-matter-just-keep-running-because-Nutella-is-coming-at-me kind of thing. You know, an average morning. The secret is in the egg wash. Must.put.cinnamon.and.vanilla.into.the.eggwash. Then of course, smearing the Nutella on the bread like your life depends on it. Because, if you’re anything like me and love a good solid treat on the weekends after a hectic week, you need this. And soaking it in that magical Churro egg wash, smelling the cinnamon and vanilla cascading into your senses, with the chocolate and hazelnut like a dream come true. Another secret…Must.fry.in.butter. Of course, I use light butter, or reduced fat, because I figure the Nutella is going to do enough damage, but I still want the Churro-ness flavour. Have I lost you? I promise, we’re getting to the good bits. Then comes that cinnamon sugar. 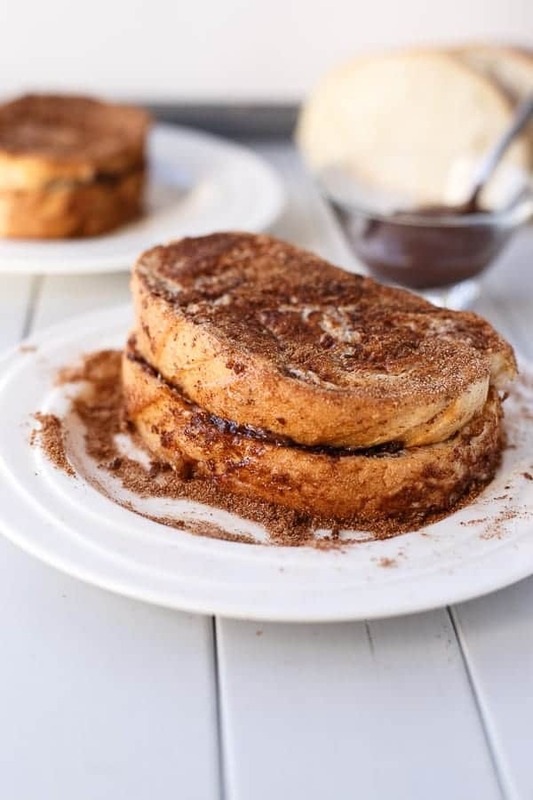 The fairy dust of all donut french toasts, and now Churro french toast. With the Nutella all warm and as melted as Nutella can get, peeking out from the centre, so of course you become 5 years old again and scoop some out with your fingers to ‘try it.’ Don’t lie, I know you do. Don’t worry, this is a sacred space. We are all here for the same reason. Nutella. 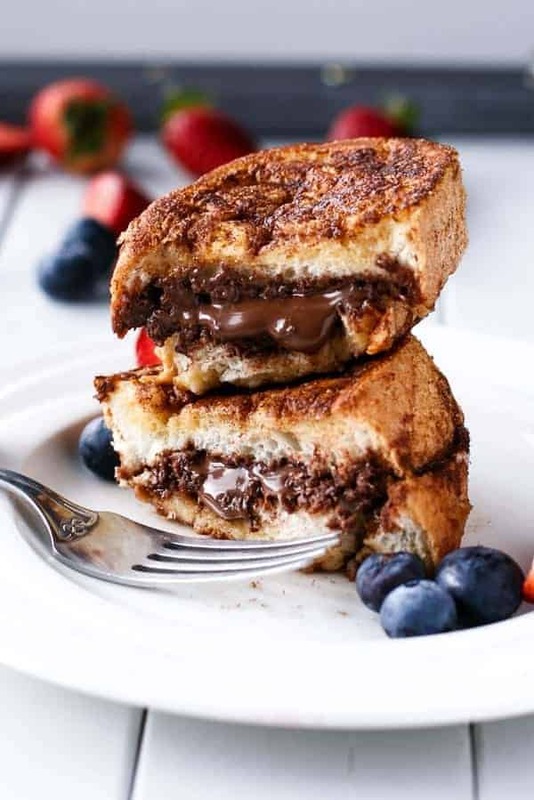 Cut it open to see the ooze of warm Nutella… That would be the best part. 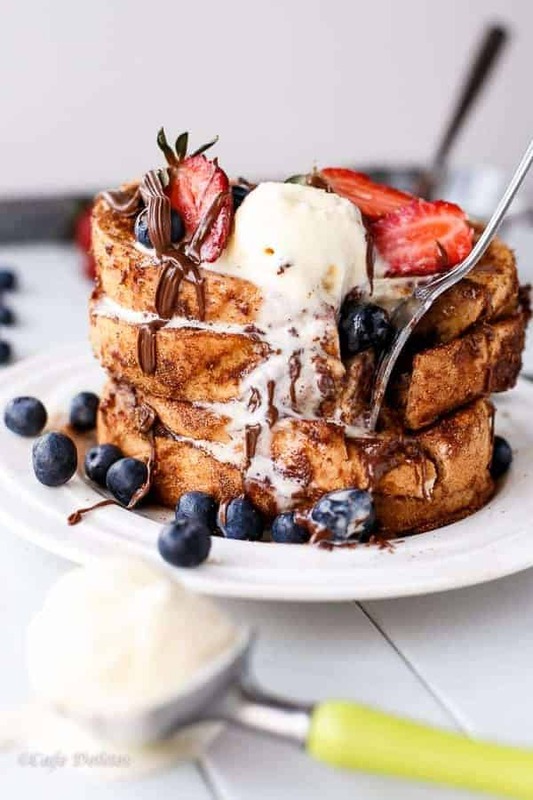 And finally, topping these French Toasts with a scoop of frozen yoghurt, ice cream, berries…. The BEST French Toasts you'll ever try. Buttery, coated in Cinnamon Sugar and FULL of CHURRO flavour! Weight Watchers: 8pp per serve! 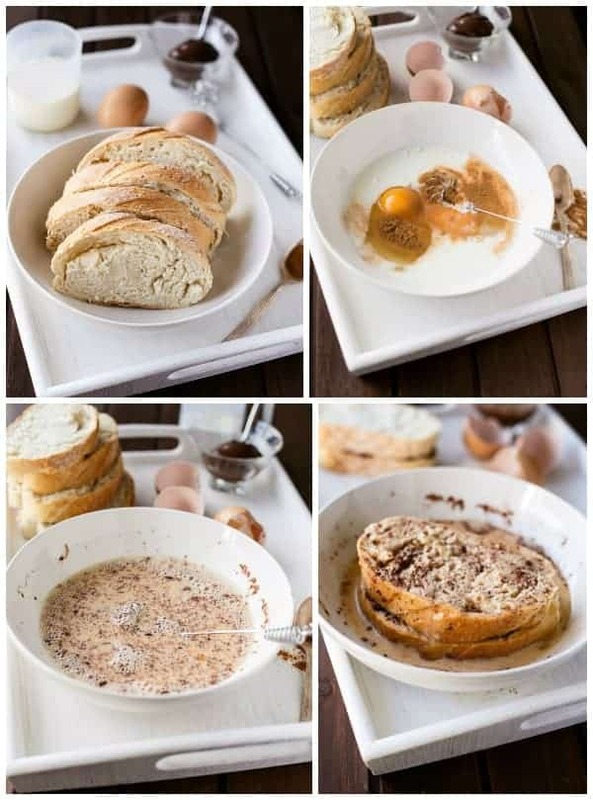 Whisk the eggs and the milk together with the cinnamon, vanilla extract and sweetener/sugar in a wide shallow bowl. 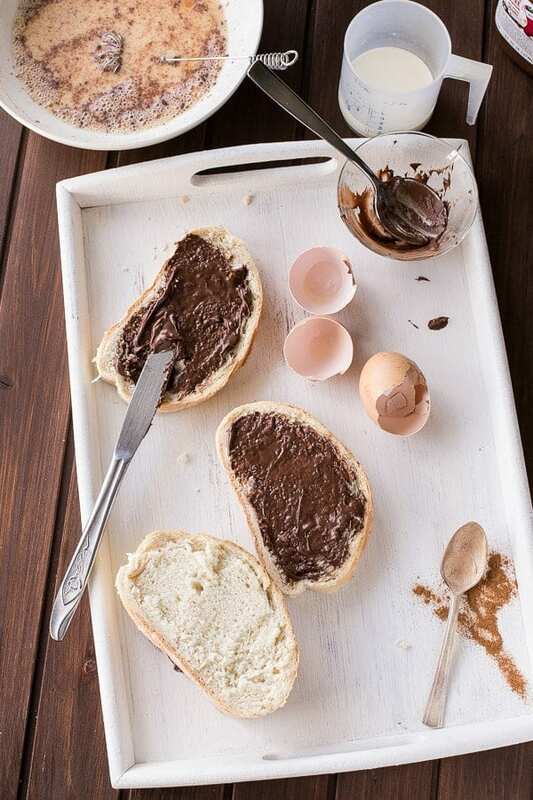 Spread 1 teaspoon of the Nutella or Hazelnut spread onto each slice and sandwich them together to make 2 sandwiches. Soak the sandwiches in the egg wash. Heat a nonstick pan/skillet with 1 teaspoon butter. Fry the egg-soaked sandwiches on low - medium heat on both sides until golden. Drizzle alllll over your Donut French Toasts!! This is total madness! I’m in love with it! haha…I loved it too when it was in front of me! can i use regular milk instead of almond vanilla? how do you think it would taste? Hi Ann! Regular milk would work perfectly! This looks fantastic! 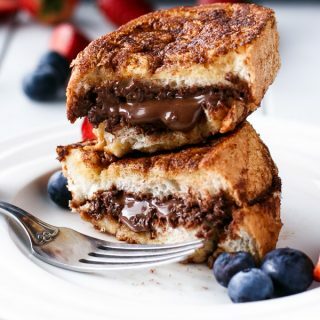 Churro French Toast AND Nutella? I think I’m in heaven! OMG these look way too good, I can just imagine the smell coming from the kitchen. I’ll definitely wake up to it no matter the time! Oh my word, I need this!! That looks amazing. I reckon you’re on to something. Double serve equals double the happiness. Yep. This looks like the most perfect breakfast I’ve ever seen! I’m in love! Definitely making this ASAP.